You are here: Home / Resources / Check Out Our Top 5 Blog Posts of 2017! It’s hard to believe we’re just a few hours away from the end of 2017. For our family, this year was definitely a mix of hard times and good times…with the birth of our 3rd son being one of the highlights of the year. I’ve also been blogging much more frequently this year, which I really enjoy. 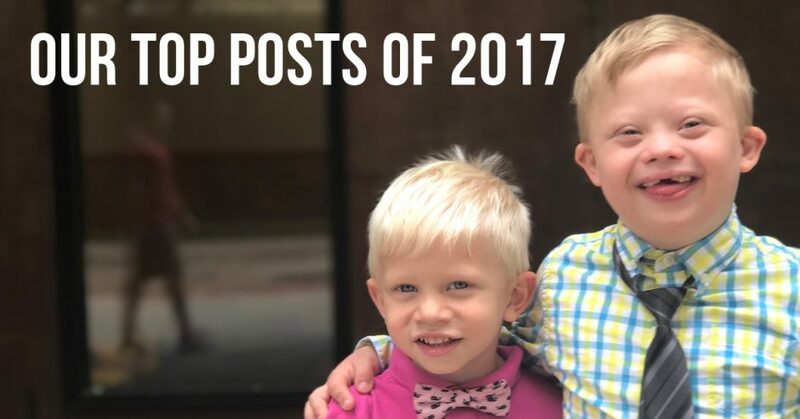 With that being said I wanted to share the top five posts that I published on this blog in 2017. If you missed any of them, be sure to check them out. 1. People With Down Syndrome Don’t Have “Special Needs” – In this post I shared a video that Lauren Potter, who played Becky on the television show, “Glee”, appeared in. This was a humous video that explained why people who have Down syndrome don’t have “special needs.” If you haven’t seen it yet, be sure to check it out! 2. A Letter to Noah’s First Grade Teacher On His First Day of School – Noah started the 1st grade this year! In this blog post I shared a letter that my wife wrote to his teacher on the first day of school. The goal of the letter was to help the teacher get to know Noah, as well as share a few of the unique challenges that Noah faces as a child with Down syndrome. Feel free to use this letter as a template for your own child if you’d like. 4. Ice, Ice, (We’re Having a) Baby!– In this blog post we shared with everyone that we were having a third child. We also shared a super fun video of us creatively sharing the news with my wife’s mom! Her reaction was priceless. 5. How a Chick-Fil-A Employee Changed My Idea of “Meaningful” Work – In this blog post I shared a story of a girl with Down syndrome I saw working at Chick-Fil-A that changed my idea of what “meaningful” work means. To everyone that follows our story on this blog, our Facebook page, Instagram feed, etc. I want to say thank you. We’ve been sharing our story for close to seven years now! We’ve met some great people, and are very encouraged by your comments, emails, messages, etc. I hope we encourage you as we share our story, as much as you guys encourage me! I’m looking forward to 2018. We have an exciting announcement to make when the time is right! So stay tuned! If you haven’t signed up to receive our posts by email, please make sure to do so, so we can stay connected. Simply enter in your email address in the box below. On top of the exciting announcement planned for next year, I’m looking forward to continuing to share our story on this blog, and social media channels. I’m also looking forward to sharing more stories of what life is like raising a child with Down syndrome in different parts of the world via the next blog series we started this year! To all of our readers, here’s to an awesome 2018! Let’s change the world together! Thanks so much for the kind words, and thanks for following story. Happy New Year to you as well!